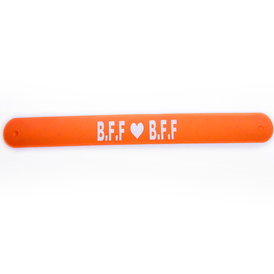 The newest slap bands are out in silicone rubber. Durable, tactile silicone gets SLAP happy with a screen printed design. Slap bands have a POP-ON spring action! SLAP 'em on your wrists, arms, legs or around cords etc. Highest quality silicone custom wristband! We continue to be a wristband leader in the industry by offering the highest quality bands at very competitive prices. Don't be misled by others low prices and suffer their low quality. We have sold and continue to sell only one level of quality, the highest! Pricing includes choice of one PMS matched silicone color with one PMS matched color imprint. For an additional PMS matched screen printed color add a $0.10(C) run charge plus an additional set-up charge for each additional color. Requires tracking label and safety testing if intended for 12 year olds and under. Please add 0.04 (A) for tracking label. Call for pricing for safety testing.